The economy is booming and unemployment numbers are dropping (reaching historical lows among many groups), both in Washington, and around the country. It’s no coincidence that state budget writers continue to see revenue projections increase with every new quarterly forecast. Federal tax cuts, increased energy exploration and a reduction in bureaucratic red tape have given consumers and investors reasons to feel hopeful and get off the sidelines. This is undoubtedly good news, but it also presents us with an opportunity to provide relief for state taxpayers and start to address some of the growing obligations government faces. You can read more about this, and a few other topics, below. If there is anything I can do for you, or if you have questions about anything in this e-newsletter, please give me a call or send me an e-mail. Also, my legislative district office is open until the 2019 legislative session begins in January. It’s in Suite 106 at 408 N. Mullan Road, in Spokane Valley, and is staffed by my legislative assistant, Janet. I very much appreciate hearing your concerns as I work for you. As always, it continues to be a great honor to represent you in the Washington State Senate. Sen. Padden with TJ Mohammed shortly after his citizenship ceremony. During the early weeks of the 2018 session, I had an opportunity to meet an impressive young man named TJ Mohammed. TJ was a Running Start student at Spokane Community College when he visited our Olympia office as part of his involvement with SCC’s student government. I really enjoyed learning about TJ’s personal journey. He spent most of his youth as a refugee in Kenya, after his family was forced to flee the bloody conflict in his native Darfur region of Sudan. In 2010, his family immigrated to America, making their home here in Spokane. TJ fully embraced the hope and opportunity of America. After attending West Valley High School in his sophomore year, he entered the Running Start program at SCC. Through student government, sports and academics, he became a leader on campus, and was one of the founders of the SCC Young Republicans. We spent much of our meeting discussing the CTCLink project, and how the mismanagement of that project has been hurting students the most, but more importantly, we made a connection that has continued. 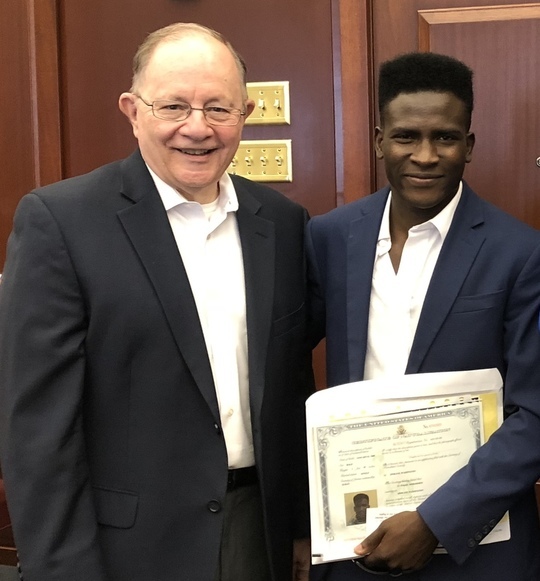 Last Tuesday, I was extremely honored and proud to be present as TJ took another big step in his journey – gaining his American citizenship. 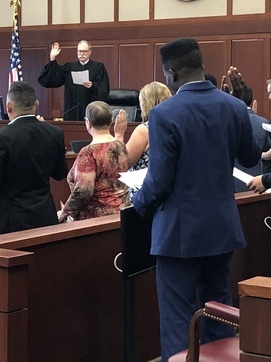 U.S. Magistrate John Rodgers administered the oath of citizenship to TJ, during a ceremony held at the Thomas S. Foley Courthouse in Spokane (pictured right). America couldn’t ask for a better addition than TJ, who is already a patriot, with a servant’s heart. He hopes to serve our country directly one day, perhaps through service in the military or the FBI. In the meantime, he has been dedicated to helping our community. As the Spokesman-Review reported earlier this year, TJ “has won the Spirit of the Community Award for his dedicated service to Mission Outreach, a program that helped him and his family when he first came to Spokane. Last summer, he logged over 200 hours of service for this organization. TJ is now attending WSU, where he is a double major in political science and criminal justice, as well as enrolled in the ROTC program. He is working this summer with the Freedom Foundation. We couldn’t be prouder of TJ. He represents the very best of what the American dream is all about. We will soon be taking applications for interns for the 2019 legislative session. Every year, the Legislative Internship Program brings over 70 college students to Olympia for a one-of-a-kind educational and professional opportunity. During the internship, which takes place in the winter quarter or spring semester, interns work for members of the state House of Representatives or Senate while earning academic credit from their schools. Paid, three-month internships are available to juniors and seniors of all majors at any college in the state. 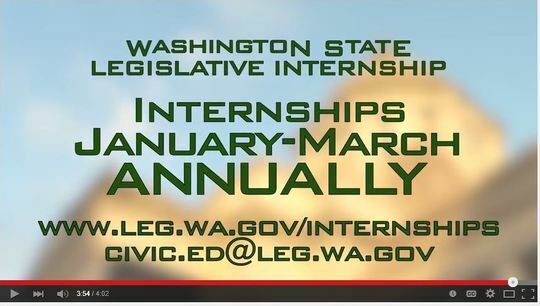 To learn more, visit: http://leg.wa.gov/internships/Pages/default.aspx or watch the video below. It’s beginning to sound like a broken record, but no one seems to mind because the song is so sweet. This month, state revenue collections came in $34 million higher than forecasted. Include July’s numbers and the revenue collections are now up an astonishing $75 million over two months. If this trend continues, it would mean nearly an additional $900 million over the two-year budget cycle. To put this in context, the underlying forecast (one of the factors considered by the Legislature’s budget writers) already assumed revenue growth of $6.2 billion for the 2017-19 budget cycle (from $39.1 billion to $45.3 billion), equal to a 16 percent increase. Yet it appears, if things stay on their current pace, even that will be a low estimate come next July. 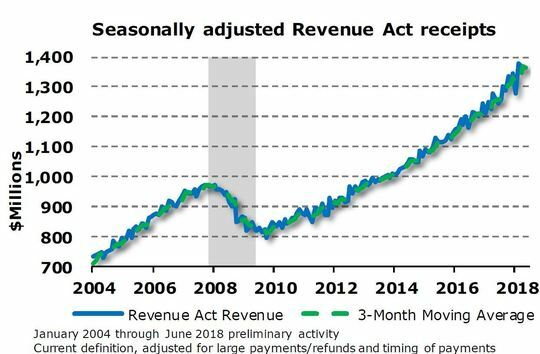 This revenue growth is due primarily to a reduction in red tape and federal tax cuts that have the economy booming, lower unemployment and a spike in both consumer and investor confidence. Employment growth in Washington over the past two months was more than 50 percent above what the state’s economist predicted (18,100 vs. 11,600). The exception? Employment in Washington’s manufacturing sector remains flat, although even that’s a win considering how it had been bleeding jobs since the end of the century. Had Governor Inslee not vetoed bipartisan tax relief targeted at the manufacturing sector, we could have seen even more improvement in this area. This is all great news, but it doesn’t give lawmakers an excuse to use the unexpected revenue to create bigger government – which could put us back on the budget rollercoaster when the inevitable economic slowdown occurs. The responsible use for this influx of tax dollars is to pay down state obligations, invest in our rainy day fund, and provide taxpayers with some well-earned tax relief. You can read the full revenue report by clicking here. 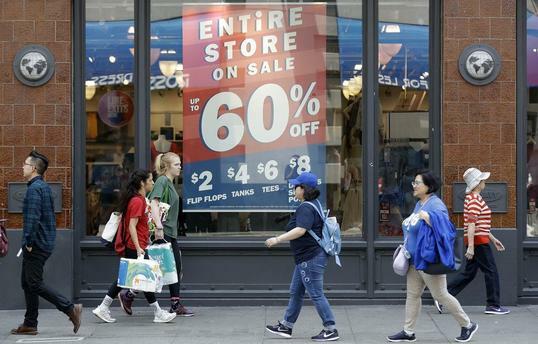 A bump in construction, as well as sales of equipment, lawn and garden supplies boosted Washington’s retail sales to more than $37 billion this year – a 10 percent increase over 2017, according to the Washington State Department of Revenue. Out of the 10 most populous cities in Washington, Spokane Valley ranked second in the state for the largest jump of taxable retail sales. With $567 million in reported sales, the city experienced a more-than 11 percent increase, trailing just behind Vancouver. To read the full story in the Spokesman-Review, click here. 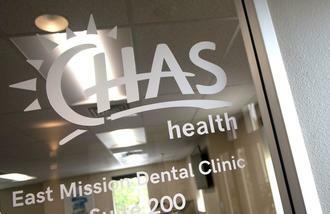 CHAS Health is expanding availability of its medical services with the addition of a new dental clinic in Spokane Valley. The East Mission Dental Clinic is an extension of the existing $2.3 million CHAS Health urgent-care facility at 1502 N. Vercler Road, which opened three years ago. … The facility was funded with more than $12 million in federal grants from the U.S. Health Resources and Services Administration and $580,000 in grant money from the Washington state capital budget. Sen. Mike Padden, R-Spokane Valley, said 4th District legislators are pleased that CHAS Health was awarded state funding for the clinic. CHAS Health, a nonprofit health center, provides medical, dental, pharmacy and behavioral health services to patients of all ages. The Law and Justice Committee hears remote testimony broadcasted from Spokane Community College. 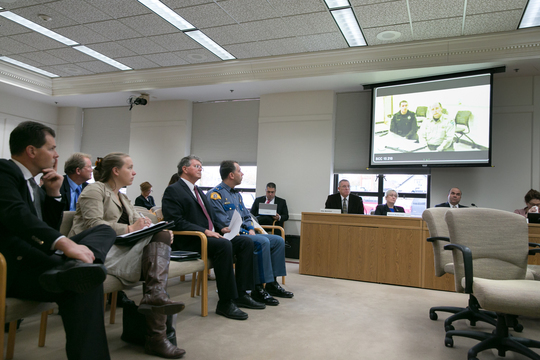 In 2018, the Senate-approved Remote Testimony Pilot Project continued to provide Washingtonians with the opportunity to supply input on legislation without having to make the sometimes-dangerous trek from Eastern Washington to Olympia. Now that we’ve reach the halfway point in the interim between the 2018 and 2019 sessions, lawmakers and staffers have begun to evaluate the results of the pilot program in order to assess lessons learned. A new report on the project is due out later this week and will help guide the next steps moving into the 2019 session. Already, citizens can sign up to testify at WSU, SCC-Spokane, SCC-Newport and North Eastern Washington ESD in Spokane. The recent news that both the City of Spokane Valley and Eastern Washington University are considering hosting remote testimony venues also gives me hope that even more Washingtonians will soon have greater access to their government. I will continue to work to expand remote testimony opportunities in the Legislature. To unsubscribe or make other changes to your subscriber preferences, click here to access the subscriber preferences page. You will need to use your email address to log in. If you have questions or problems with the subscription service, please contact subscriberhelp.govdelivery.com. This news comes to you from Sen. Mike Padden.